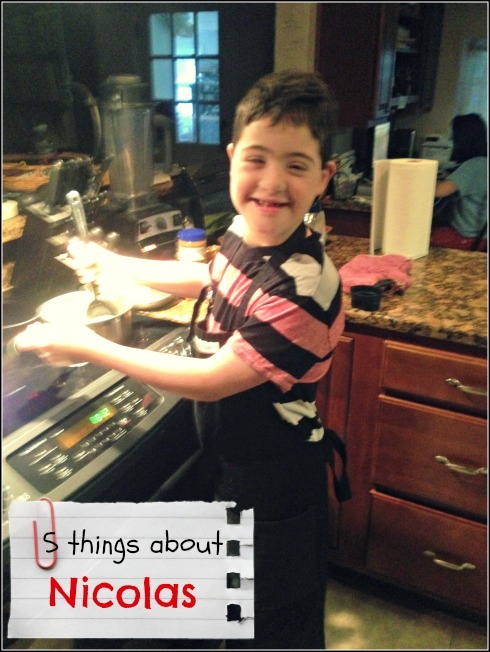 The International Down Syndrome Coalition has asked bloggers to share five things we want the world to know about our kids. He wants to work in a restaurant when he grows up. Coming from a family that loves food, growing up eating lots of Cuban food, barbecue and pizza plus a brother who is a culinary student and a mom who is a food snob, I guess this was to be expected. He is the class clown with a huge smile all over his face. My Facebook feed wouldn’t be the same without his amusing observations. He is stubborn and ornery. This one isn’t always funny. He has very set ideas about what he’s going to do and if he we try to shift gears he’ll get very obstinate. If he knows something is going on that he’s excited about, he’ll be up at the crack of dawn getting dressed and ready for the event even if it isn’t until later in the day. He likes to show off his Downward Facing Dog. Nicolas likes to watch me do yoga but he can be far better at it then me. He is extremely flexible, knows it and likes to show off. 12 years after his appearance into our family none of us are the same. We’re long past the initial fear and apprehension. There have been many joys and some heartache but would not have missed it for the world. Our family would never be the same without him. This is a blog hop…Please visit some of the other great family blogs! Down Syndrome Awareness Month is a whole month dedicated to increasing awareness and acceptance of people with Down Syndrome. There is a whole lot of fear surrounding Down Syndrome and the more of us that start speaking out about how our kids have impacted our lives, we can in turn start impacting others and work together to create more acceptance for our kids and all people impacted by disability. 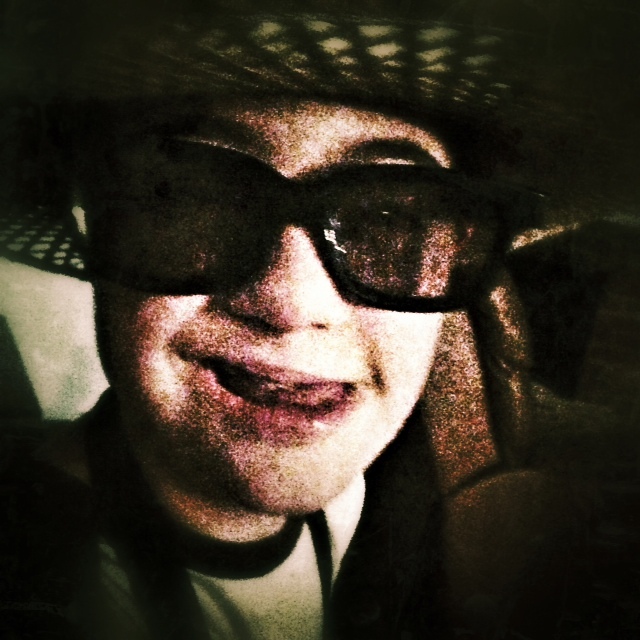 What’s it like to raise a kid with Down Syndrome? It’s FUN! Challenging at times? Without a doubt. Nicolas has a will of iron. He’s also is a heart patient with a pacemaker. He had open heart surgery at 2 1/2 months old. We’ve gone through all the struggles families like ours experience. But these trials have made us stronger and more compassionate people. We couldn’t imagine our lives without Nicolas. Nicolas is the biggest character around and turns everything around him into a party. He’s greatly loved by his family, his church and his school. Noah and his Dad are having fun educating folks at NoahsDad. I wish every family receiving a prenatal Down Syndrome diagnosis could watch this video! I didn’t know Robert Ethan Saylor. But I am mourning as deeply as if I did. I am grieved over the senseless loss of a kind and innocent soul over the price of a movie ticket. And because this could be my son in the future. Not even close to being stocky, my little guy with the pacemaker who is well known to be stubborn and has difficulty with transitions could have something like this in his future. It would probably kill him instantly. If you are hearing about this for the first time, Robert Ethan Saylor lost his life on the floor of a movie theater at the hands of three off duty police officers because he wanted to stay and watch the movie again. News reports stated “An autopsy showed Saylor died of asphyxiation brought on by his Down Syndrome. The medical examiner ruled his death a homicide, but the grand jury found no evidence to charge the deputies.” So, it’s death by Down Syndrome. Last week the Internet and my Facebook stream featured dozens of images of cute kids with socks and touching videos. I don’t mind these. Those adorable pictures got me through the early days of coming to terms with the reality of giving birth to a little boy with Down Syndrome and a serious congenital heart defect. It should be noted that there are two other recent police brutality cases involving young men with Down Syndrome. In December of 2012, news reports stated that Antonio Martinez, 21, was walking to his family’s bakery while officers were in the area responding to a domestic violence call. An officer thought he looked suspicious and stopped him. When asked to stop, he wouldn’t listen. He was pepper sprayed, hit on the head with a baton and handcuffed. In September of 2011 Gilberto Powell, 22, was stopped by Miami-Dade officers after they saw a bulge in his waist band. (It was his colostomy bag.) News reports state that he tried to run when they patted him down. Police said Powell broke free as officers tried to place him in handcuffs, hitting his head on the ground. He was struck in the face and handcuffed. Three sets of handcuffs were placed on Ethan Saylor. This wasn’t even about proper training. This was simple common sense. Any parent or professional who works with the Down Syndrome population knows they need a longer time to process information, that communication is difficult, and that transitions can be tough but can often be handled with a gentle tone. Maybe a first/then. At the very least they could have called his family and just waited. Or maybe they could have extended a little grace and bought him the damn ticket. I hope and pray that we see justice for Ethan. This is a Rosa Parks moment for the disability community. Ethan’s death cries out for justice. This is personal to all of us in the Down Syndrome Community. We’re not going to let this get swept under the rug.